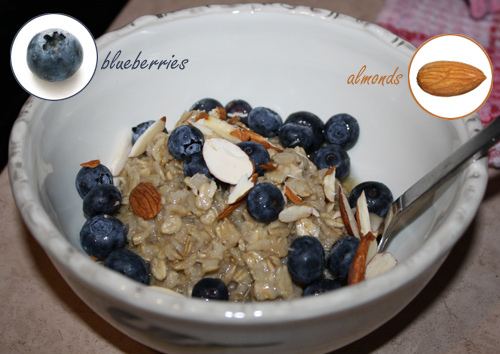 Share the post "Oatmeal for Breakfast"
I love this hot oatmeal breakfast. Oats lowers cholesterol levels because of their specific type of fiber which gets rid of excess cholesterol in the digestive system and also increases your immune system. Optional toppings: fruits like blueberries, raspberries, apples, cranberries. Sprinkle of flax seed meal, toasted coconut, maple syrup, thinly sliced almonds or any other favorite nuts.